There have been jaw-dropping moments in the early days of free agency—the $15-million-and-north deals signed by men (Olivier Vernon, Brock Osweiler and Malik Jackson) with lower Q ratings than the lefty setup man for the Mariners, or the fact that the New York Giants are spending like they’ve never spent in their history—but I’ll give you one that stuns me: Howie Roseman has returned to run the Eagles in the most hands-on way of any GM in football. You remember Roseman. He’s the Andy Reid acolyte (MMQB Word of the Day! Look it up!) who was consigned to an invisible fate last year when Chip Kelly took over all things football with the Eagles. The year in exile gave Roseman a chance to take some General Manager Continuing Education classes at Lurie University. More about that later, but has any general manager ever hit the ground running the way Roseman has in the 10 weeks since he retook control of the franchise that was once his? • Run the head-coaching search that resulted in the Doug Pederson hire. • Signed five veteran starters, including quarterback Sam Bradford, and two reserves to new contracts. 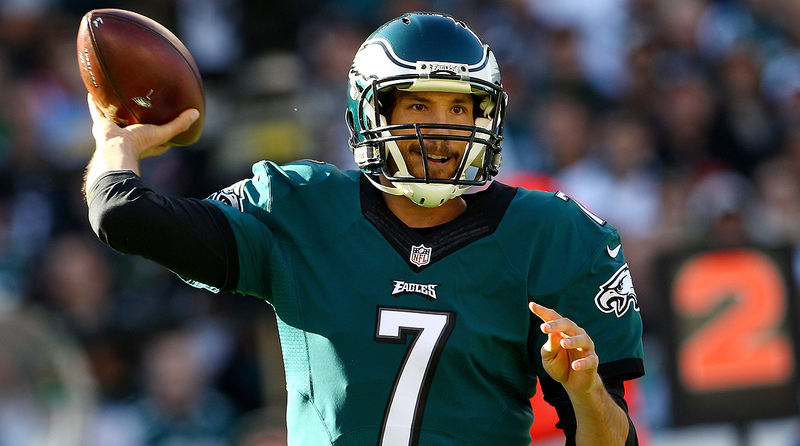 Sam Bradford inked a two-year deal with the Eagles but will still face competition at the quarterback position. • Traded three starters, two with tremendously bloated contracts, and got only improved draft position in return, in the best illustration (as it looks now) of addition by subtraction in the NFL this off-season. • Signed six free agents in a 48-hour span, five of whom will either start or compete for starting jobs. The sixth, backup quarterback and Pederson favorite Chase Daniel, was imported for $7 million a year, meaning Bradford can’t have too many clunkers in a row this season. • Moved up from 13th to eighth in the first round of a draft in which the Eagles believe there’s a line of demarcation after the top 10 players on their board. • And in an underreported illustration that Roseman and the Eagles are big enough—even in the wake of the sudden and disagreeable parting with Kelly—to learn from everything in the football universe, the club decided to keep a huge Kelly hire, sports science czar Shaun Huls, who had some forward-thinking ideas about nutrition and body maintenance. That says a lot to me—a lot of good—about Roseman. The relationship between him and Kelly soured last year, and Roseman said in our interview Friday that he simply wanted to look forward and not rehash what happened in the Kelly days. But I give him credit for this: Roseman still learned from a man with new ideas and good ideas, even if many of them didn’t bear fruit in Philadelphia, and even if the relationship went south. On Friday, Roseman told me that in his time away from a position of influence with the Eagles last year, he learned about the business of sport and the cultivation and development of players from franchise-runners in the NBA, Major League Baseball, NHL and the English Premier League. That’s right. He said that his time at a British sports seminar last November gave him a chance to learn a lot from some of the power teams in world soccer—Chelsea, Manchester United, Bayern Munich, Manchester City—about the importance of character in team-building, and about the skills needed to meld players speaking different languages from different cultures with a team of totally different people. 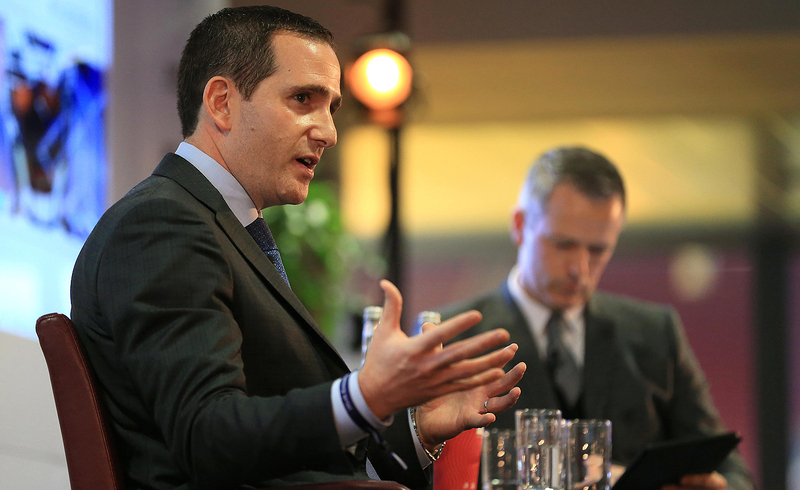 Howie Roseman credits time spent at the Leaders Sport Performance Summit in London last year in helping prepare him to guide the Eagles again. Roseman was complimentary toward cornerback Byron Maxwell and linebacker Kiko Alonso, but clearly neither big deal worked out for the Eagles last year. Miami needed a rangy inside linebacker, which Alonso was in Buffalo in 2013, and a tall corner, which Maxwell is. So the deal got done, a move from 13 to eight in the first round. On the long-used Draft Value Trade chart, the difference between the 13th and eighth pick in the draft is equivalent to the 68th pick in the draft, a high third-round choice. To rid themselves of the heavy Maxwell contract, that seems like fair value. What Roseman still wants to do is to find a receiver with deep speed. And he’d love to get burgeoning star Fletcher Cox signed long-term. But what he’s done so far is, well, a lot. And a general manager who does too. Brock Osweiler won’t have to wait long to see his old Denver teammates: the Broncos and Texans are scheduled to meet in 2016. • Some people very close to Osweiler at midday Wednesday thought he was going to pick the Broncos. Most believer Osweiler had a mad-on against the team after getting benched for a hobbling Peyton Manning in Week 17, and so Osweiler was as good as gone when the season ended. “Not true,” said someone close to Osweiler. “I can’t speak for those in his family, but Brock was not mad at the Broncos over it.” (Nor should he have been, by the way. Osweiler’s performance in the second half of the season was both encouraging and very uneven. Manning deserved to get his job back at halftime of the last regular-season game.) Osweiler had to decide between Houston’s four-year, $72 million offer, with about $37 million guaranteed; and Denver’s four-year, $65 million offer, with about $29 million guaranteed. At one point around midday Wednesday, Osweiler asked agent Jimmy Sexton for some private time to think and decide. When he called Sexton back, Osweiler told him he wanted to go to Houston. This is not the mindset of man who knew he was out of Denver all along. • I’d probably have picked Denver over Houston, but there’s one huge mitigating factor. Houston has a very good front seven and otherwise an average team—at least now. Denver has an excellent defense, two very good receivers, and a mediocre offensive supporting cast. The Broncos are a better team, even with the recent defections. But if you’re Osweiler, and you’re realistic, you have to think there’s some doubt about whether you’re going to be an above-average NFL starter—which is how Houston is paying you. So the guarantee is significant. Very significant. If he busts after a year or two, he knows he has $8 million more locked in if he signs with Houston versus signing with Denver. • Houston did what a desperate team had to do. This is year 15 of the Texans. They thought they had a long-term passer with David Carr, and then with Matt Schaub. Neither panned out. The desperation turned to panic after the horror of the Brian Hoyer playoff performance in January. Paying the best quarterback in a thin free-agent quarterback market, in a year when there’s no sure passer where the Texans are drafting? The gamble on Osweiler is not stupid. It’s way too much money, of course, but the cap’s been skyrocketing in recent years, which allows the Texans to cushion their mistakes if indeed Osweiler is a bust. You have no chance to go all the way if you don’t have a quarterback. Houston now at least has a chance for the kind of quarterback who can win in January. A chance. That’s more than the Texans could have said last Tuesday. • Don’t blame Elway. No one knows how Osweiler will pan out. And especially with the hurt feelings inside the Broncos’ building when Osweiler wouldn’t return calls of coaches and the front office for a few days during crunch time … that didn’t go over well with a team that had been supportive of Osweiler for four years. I think Houston paying Osweiler is understandable, and I think Denver not paying him is probably more understandable. I get why Houston did it, but I would never have paid that freight either. • I doubt Osweiler will get much love on the field before Houston at Denver (which is on the schedule next fall). “I think the Houston Texans give me the best opportunity to be successful,” he said upon signing in Texas. Over the past four seasons Denver has the best record in football and has been to two Super Bowls; Houston is 33-34 and has won one playoff game. 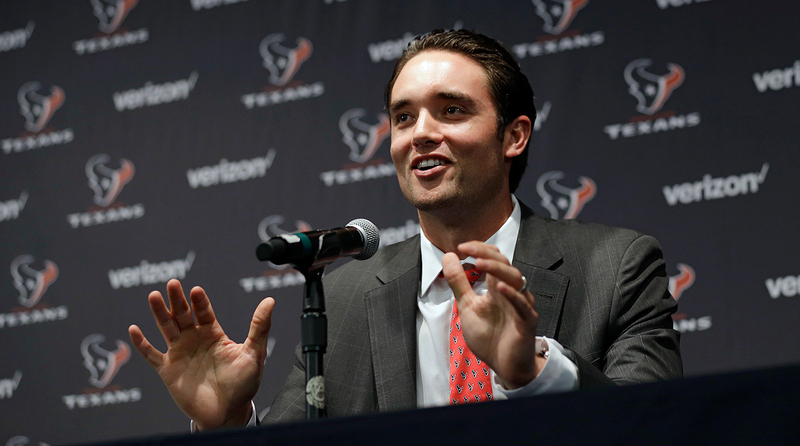 Osweiler might have been saying the politically correct thing in Houston. But aside from the fact that the quote seems nuts, it’s the kind of statement those in Denver heard and won’t forget. After letting Ndamukong Suh head to the Dolphins in free agency last offseason, the Lions got the 95th overall pick in this year's draft as compensation. To clarify: Other factors play into the Compensatory Pick system, including other picks gained and lost influencing the number of picks awarded. On the surface, my first reaction is how overpaid Maxwell was, how incomplete the ledger of Thomas is after being hurt much of last season, and how relatively little impact two very good players, Suh and Revis, had. (They were good last year, but not superstars.) It’s silly to say Suh is equivalent to a late third-round pick in value, but that’s not the point. Take Suh, for example. Would you rather have a top-100 draft pick, or a very good player who is not always great, who is going to weigh down your salary cap by an average of $19 million a year for six years? In general, I’m not a big fan of paying 29-year-old non-quarterbacks quarterback money. And I think teams like Baltimore, year in and year out, show the value of letting big free agents walk and taking the Compensatory Picks instead, a year later. Williams, the ex-Bills pass-rusher, and Maxwell, the spurned Eagle cornerback, will cost a combined $17 million in average contract value to the Dolphins this season. And the third-round pick comes from what Miami is likely to get as a Compensatory Pick in return for Vernon taking his huge deal with the Giants. (Williams will not factor into the Compensatory Pick system because he was a released player and signed before the start of free agency.) 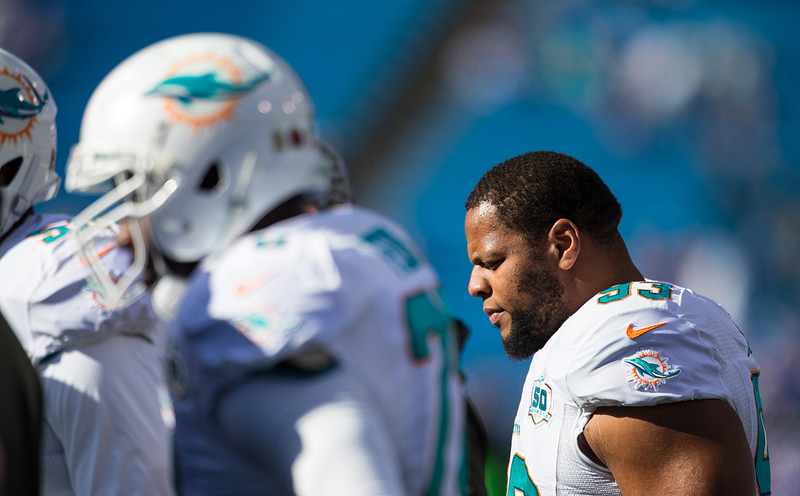 The Dolphins are taking risks on three players. New defensive coordinator Vance Joseph will have to find a way to rekindle the fire in Williams; some in Buffalo think he played with no love of football last season. The 6-1 Maxwell is just an average corner who was overpaid significantly by the Eagles, but he could fill a need because big receivers like Brandon Marshall (two games versus Miami last year: 16 catches, 259 yards) torched Miami’s smaller corners last year. Alonso was terrific in 2013, missed 2014 with ACL surgery, and was a non-factor in 2015 for the Eagles. For the Miami deals to be good, at least two of those three players must be big contributors. • Calvin Johnson and the Pro Football Hall of Fame. Over my 25 years as a Hall of Fame voter, the best piece of advice I ever got was from Paul Zimmerman, my old Sports Illustrated colleague, who said, “You watch the games. You’ve got eyes! Trust ’em!” With Calvin Johnson, if I get to vote five years from now, I will trust those eyes. Those eyes look at Calvin Johnson as the best big, physical receiver I have seen in 32 years covering the NFL. We’re in a time of great receiving numbers and great receivers. If I had to pick one receiver as the top guy over the past decade, from 2006 to 2015, my number one would be Calvin Johnson, though his rookie year in the NFL was 2007. I am a huge fan of the five-year waiting period for players after they retire before they can be eligible for the Hall, because it eliminates precipitous, emotional decisions. But in a time when the air is filled with footballs more than ever, I think Johnson is deserving of a Hall vote. Now, Johnson is 43rd all time, with 731 catches; 27th all time, with 11,619 receiving yards; and 22nd all time, with 83 receiving touchdowns. But he is second in history with 86.1 receiving yards per game. And he has more receptions per game (5.4 to 5.1) than the great Jerry Rice, and Johnson had 10.5 more receiving yards per game than Rice. Comparing their three best receiving years in succession against each other, Johnson’s three were 287 yards better. I do think career longevity is an important factor; if Johnson had played five outstanding years instead of eight, it would be tough for me to vote for him. I also think numbers should matter in the long line for entry. But I also think all-time greats who played nine seasons, with seven or eight of them at the top of the position, are exceedingly worthy of induction. 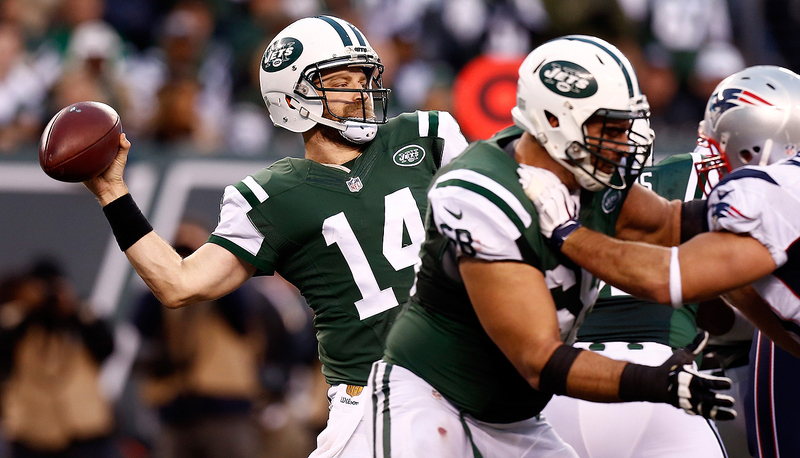 The Jets are Ryan Fitzpatrick’s sixth team in his 11-year career in the NFL. • Enough with the Fitzpatrick panic already. I live in New York. I read the papers. Many days, there are hand-wringing stories about the contract stalemate between journeyman quarterback Ryan Fitzpatrick (coming off the best year of his career) and the Jets. Close as I can figure, the Jets have an offer of slightly more than $7 million per year on the table for Fitzpatrick, who is coming off career highs in passing yards (3,905 yards), touchdowns (31) and wins (10). Fitzpatrick is not likely to match his 2015 success if you consider his record. But this is a day when Brock Osweiler, starter of seven career games, gets a deal averaging $18 million a year. So we can all agree that $7 million a year (same as Eagles backup Chase Daniel just got) is patently absurd. But that is not the point. The point is this: The draft is seven weeks away. The start of training camp is 19 weeks away. There is zero urgency to get this contract done now. Jets GM Mike Maccagnan will bring up his offer, in time, to something in the $12-million-a-year range, if he’s being fair. Until then, Fitzpatrick and his agent, Jimmy Sexton, should sit back and hope the phone call from Denver or San Francisco or Cleveland comes with some interest. Maccagnan’s not stupid. He knows his offer is lousy. He also knows he has 133 days until the start of camp, when he’ll need a starting quarterback. For now, it’s negotiating season, and there’s no reason to be too hot about this. • When one signing can mean two things. Ace inside linebacker Jerrell Freeman moving from Indianapolis to Chicago means the Bears will likely waive goodbye to a disappointing first-round pick, Shea McClellin, the 19th overall choice in the 2012 draft. The Bears drafted him looking for a poor man’s Brian Urlacher, but he never came close. Now with Freeman and John Fox favorite Danny Trevathan signed in free agency to win the middle of the field, McClellin will be out. But it also means the Colts will have to replace their leading tackler over the past three seasons. Though D’Qwell Jackson is one-half of a capable inside-linebacker duo, Freeman will be missed in Indy. • It’s not a lock that C.J. Anderson will be a Dolphin. John Elway mistakenly applied the contract tag on Anderson that would give Denver the right of first refusal if he signed elsewhere, instead of giving him a higher tag that would have brought a draft choice back if Anderson chose to leave. So Miami signed Anderson to a four-year, $18 million deal that most believe Elway won’t match. But Elway might match. I believe he hasn’t decided yet—he has until Tuesday—and is thinking seriously about keep Anderson for the contract Miami invented to try to steal him, a bigger number than Elway would have liked Anderson to have ($6 million in year one). But now that number is more doable because Denver has lost high-priced Malik Jackson and Brock Osweiler and theoretically can afford it. • We fall for it every year. Good for players to be able to make these millions. Better them than the owners. But did you notice something about the free market this year? Two-thirds of the teams in the league sat out the frenzy. Nine teams did most of the damage in the first four days of freedom this year. What does that say? Are teams getting smarter? I don’t know, but I do know this: The start of this free-agency period had more people stunned at two contracts—$17 million a year to Vernon, and $18 million a year to Osweiler—than I can remember. History says the first few days of free agency always bring the kind of overpayment that looks dumb a couple years later. This year, maybe 22 or 23 teams, some of which have a ton of cap room, heeded that alert. • Finally, on the Logan Mankins retirement. The Bucs knew a couple of weeks ago the 11-year-veteran guard Mankins was going to retire. They asked Mankins 10 or 11 days ago how he wanted to handle it. He didn’t really care, but he didn’t want to have a news conference, and he didn’t want to issue a statement; he simply wanted to fade away. “I do not want this to be a big deal,” he told the team. After a dignified career and seven Pro Bowls, Mankins certainly deserved to go out the way he wanted. The Bucs were going to announce it one day last week, and then it began to leak on the morning of Peyton Manning’s retirement gala in Denver. For Mankins, that was perfect. That day, he officially retired, and it was completely overshadowed by the Manning festivities. Mankins—nine years a Patriot and two seasons a Buc—will go down as a perfect Bill Belichick player; tough and quiet and a great leader. And very good; he missed one game due to injury in his last three years. It’s great when very good players get to retire on their terms, and they get to retire exactly the way they want. For Mankins, the Manning retirement couldn’t have come at a better time. 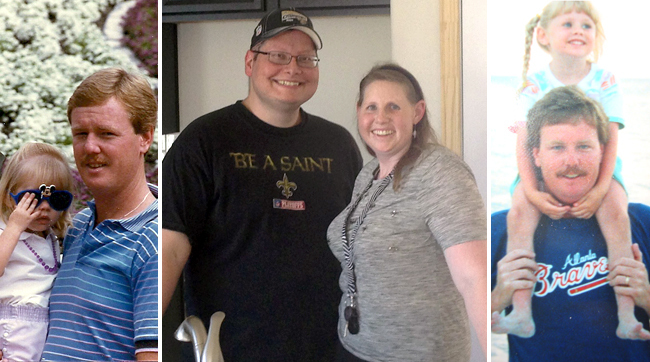 Last September I met Christie and Trey Bomar at a newly built home in Denton, Texas. This was their first house together, and they had just closed on it. Like many of you, we had been following Ed Werder's updates on Twitter about the medical challenges faced by Christie, his daughter, and Trey, her husband. Peter, a friend of Werder’s for decades, suggested I visit them in Texas to tell their story. Christie and Trey took me inside their home, showing me the flooring they’d picked out, measuring the space for the fridge and describing their plans to decorate the guest room—where they said I was welcome to visit anytime. Afterward, we went to dinner, and even though their beloved Chuy’s was nearby, they were worried I wouldn't like the hole-in-the-wall Mexican joint. So we went somewhere else. I planned to pay for their dinner, but Trey was adamant that I did not. He’d just finished his 24th round of chemotherapy that week, all the while squeezing in 40-hour work weeks as a team leader at Honda Financial Services, but he didn’t want so much as a free dinner. That’s the kind of person he was. Early Saturday morning, Trey passed away, with Christie by his side. Most of us know Werder as a trusted newsbreaker, in his job as an NFL insider for ESPN, but this was the news that he and his family had spent the past two years trying to ward off. You may remember that Werder’s tweets first were about Christie, who was relearning how to walk, talk and use the right side of her body after an eight-and-a-half hour brain surgery to remove a cavernous angioma, a rare malformation of blood vessels that was bleeding into her brain. That was the summer of 2012—a few weeks after Christie married Trey, and 16 years after her childhood battle against a pea-sized tumor on her pituitary gland. Those two medical issues were almost certainly related. Then, suddenly, Werder's tweets switched to Trey. Early in 2014, Trey had been having stomach pain, originally diagnosed as diverticulitis, a treatable inflammation of the intestine. But during his colonoscopy Christie was stunned when the gastroenterologist rushed into the waiting room, still in full scrubs and a mask, to tell her, “Your husband has colon cancer.” They'd soon learn that it was Stage 4, meaning that it had already spread to other organs in his body. Trey was only 29 when he was diagnosed. The odds of a young couple enduring the combined health challenges the Bomars faced were something in the neighborhood of 1 in 25 million. All of it is unfair: The medical burden they bore for the entire length of their marriage, and most especially, losing Trey at age 31. But the remarkable thing is that Christie and Trey never described anything as unfair, or as a burden. Christie believed that she’d been through all she had in order for her to help Trey. “Every day you wake up,” she would tell Trey, “you are beating cancer.” The chemotherapy Trey received was never very effective, but he embraced the schedule of infusions every other week for nearly two years, ignoring the nausea in the hopes that any marginal benefit would keep him around as long as possible for Christie. After 37 rounds, his body finally gave out. Whether it was Christie’s fight, or Trey’s fight, it was everyone’s fight. Because of Werder, Trey, an avowed Saints fan, got to meet Drew Brees, on the sideline of a Halloween weekend game in New Orleans last year. Werder joined Trey in Houston every three months, even during football season, for his progress scans at M.D. Anderson Cancer Center, where the news almost always was discouraging. On Friday, the day before he passed, Trey sought comfort from Jill Werder, Christie's mom, and Baby Henry, the son of Christie’s brother. Last year, Christie and Trey started a cancer support group at their church, which Christie named “Anchor.” Someone asked her why she chose that symbol. “An anchor is so heavy, it’s a burden, something you have to drag around,” the person said. “No, it's not,” Christie responded. “An anchor is what keeps you grounded. When the seas are choppy, you lower your anchor so you don’t drift too far.” Christie, Trey and the Werder family lived their life together as anchors for each other, holding firm even when the seas became choppiest. “Yes, there is progression and new issues,” Trey wrote in a text-message update after one doctor’s appointment in November, “but the cancer is not winning.” That’s the memory Trey leaves behind. Life is unfair, but Trey Bomar chose not to live his that way. 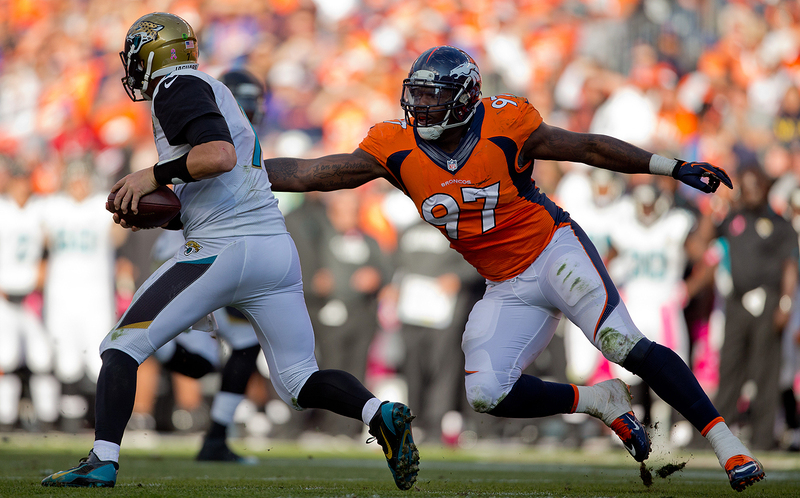 Malik Jackson will be chasing all quarterbacks except Jacksonville’s after the team signed him to a $90 million contract in free agency. —New Jacksonville defensive lineman Malik Jackson, who received a six-year contract with a max value of $90 million on the first day of free agency. —Bryce Harper of the Washington Nationals, in a long screed about baseball needing to loosen up, to Tim Keown of ESPN the Magazine. Excellent Harper story. —Cleveland cornerback Tramon Williams, who played against Calvin Johnson 14 times, on the retirement of Johnson for a cornerback roundtable in The MMQB. —Denver coach Gary Kubiak, to defensive coordinator Wade Phillips, after the Super Bowl victory over Carolina, on the Cinedigm/NFL Films production of the Super Bowl video, which is on sale this week. I always love these videos, because you see things a month after the fact (Von Miller to an official, pre-Super Bowl opening kickoff: “If I don’t get any sacks, you know they’re holding me”) that are so illuminating regarding what happened in the game. This video takes you back to the first playoff game—the tougher-than-it-should-have-been survival test to beat Pittsburgh, with great footage from some clutch plays in the final minutes—and also illustrates so well the physical punishment the Broncos put on Tom Brady over eight quarters of the regular season and playoffs. Another strong aspect of the video is the featuring of Denver defensive line coach Bill Kollar, one of the underrated grunts of NFL coaching who was a very important part of the Broncos’ Super Bowl run. Annually, this Super Bowl video is some of NFL Films’ best work. I’d highly recommend this one, not only to Denver fans excited about winning the Super Bowl but also to NFL Films fans who can’t get enough of their great imagery. The Broncos got an up-close-and-personal look at potential trade target A.J. McCarron in a late-December meeting against the Bengals. 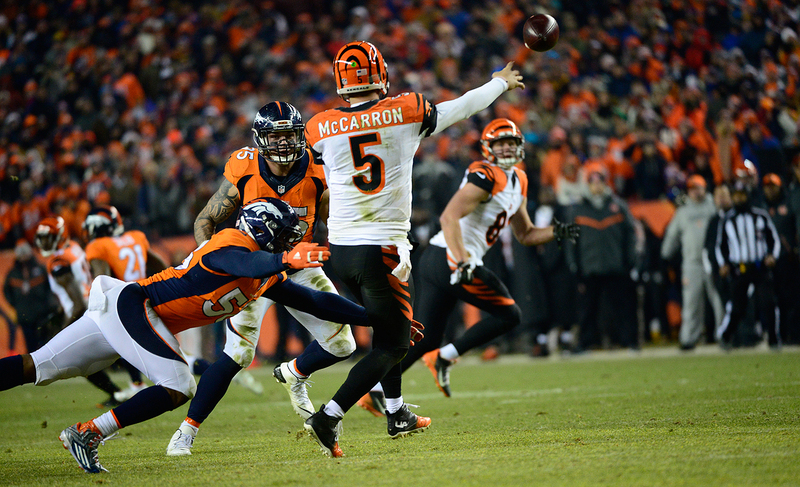 • In the last four games of the regular season, when McCarron played for the injured Andy Dalton, McCarron completed 69, 71, 63 and 63 percent of his passes, including a 63-percent day against the league’s top defense, Denver. • His 97.1 rating would have been ninth in the NFL had he qualified. • In yards per pass attempt, a key number all coordinators are mindful of, McCarron and Osweiler both recorded 7.2 yards per pass play. • Points per games in 2015, in games they started and played the whole game: Osweiler 20.5, McCarron 20.3. I’d call Bengals boss Mike Brown if I were John Elway, just to check out McCarron’s availability. Baltimore signing tight end Benjamin Watson to a two-year, $7 million contract was the most interesting signing of the start of the free-agency period to me. Many reasons. Baltimore doesn’t wade into free agency much at all; the Ravens have signed two unrestricted free agents at the dawn of the free market in the past seven years. Baltimore has two highly regarded tight ends, Crockett Gilmore and Maxx Williams. There were three much more highly regarded tight ends on the market (Coby Fleener, Ladarius Green, Dwayne Allen) if Baltimore wanted a tight end. But Baltimore is an iconoclastic organization. The Ravens can look at video and see that Watson is coming off a ridiculously good season, the most productive season of a middling career. He set personal bests, in his 12th NFL season, for targets (110) and receptions (74), replacing Jimmy Graham as Drew Brees’s main tight-end target. What also intrigued me about the signing is that Watson is one of the most unique players in recent history to go free. Over the past four seasons—at age 32, 33, 34 and 35—he missed one game due to injury (a 2013 concussion). The three prime guys I mentioned average $6.5 million per year in their deals. Watson was had for 55 percent of that. Watson caught 74 balls last fall, as I said, and Allen, Fleener and Green caught 107 between them. The four most active teams in free agency last year were the Jets, Eagles, Dolphins and Jaguars. They went a combined 28-36 in 2015. None made the playoffs. Per Ben Volin of the Boston Globe, with the retirements of Charles Woodson, Peyton Manning and Matt Hasselbeck, Tom Brady—who turns 39 in August—is the oldest non-kicker/punter in the NFL. Calvin Johnson played his last football game at 30 years, 3 months old. Barry Sanders played his last football game at 30 years, 5 months old. Calvin Johnson was the second pick in the first round of the 2007 draft. Barry Sanders was the third pick of the first round of the 1989 draft. Calvin Johnson retired without a press conference, through a statement. Barry Sanders retired without a press conference, through a faxed retirement letter to his hometown newspaper, the Wichita Eagle. Precipitous Decline of Newspapers Dept. Item 1: One out-of-market newspaper scribe, Sam Farmer of the Los Angeles Times, was on hand in Denver for the Peyton Manning retirement event last Monday. Seems bad for the business, not being able to buy a newspaper before you’re captive on a four-hour train trip. Kids, I’d recommend a diverse portfolio of media experiences in college if you want to be in this business. 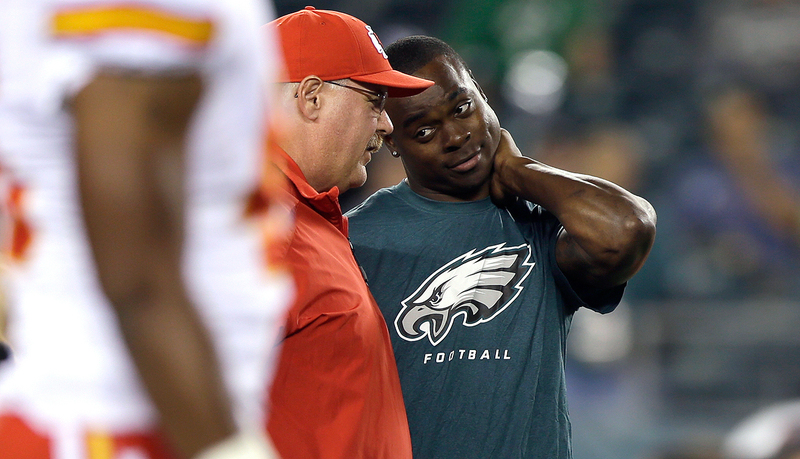 Andy Reid and Jeremy Maclin's relationship dates back to their days in Philadelphia. 1. I think I am bothered by the NFL’s sanction of the Chiefs over illegal contact between the organization and Jeremy Maclin last year before free agency began. The NFL believes the Chiefs spoke with Maclin not only during the “legal tampering period” but also before then. Is it illegal? Yes. But it’s like going 61 in a 55-mph zone. You’re not getting ticketed for that in 49 out of 50 states. To get whacked third-round and sixth-round picks by the NFL office is a heavy tariff for it. I spoke with an agent the other day who told me—without names—that two of his free-agent clients this year had contact before free-agency began with coaches (one a head coach, one an assistant coach) on teams desiring to sign them when the free market opened. This agent said something smart: “The league has to realize football is a relationship business. Andy Reid built up a relationship with Jeremy Maclin—and I know enough about Reid that just because he leaves somewhere it doesn’t mean he’s going to stop caring about players he was close to, over lots of years. The league doesn’t know how often players talk to their former coaches and former assistants. Think of all the time they spent together. Does it make any sense to you at all that once a player leaves a team after four or five years that all contact between that player and the people who coached and cared about him for years would just stop? It’s ridiculous.” I do understand why the league came down hard on the Chiefs—the NFL clearly believed the Chiefs communicated directly with Maclin that he would be well taken care of (to the tune of $11 million per year, as it turned out) before the tampering period began, and so that meant that the Eagles didn’t have the full window to try to get Maclin signed before free agency began. And the purported contact with Maclin from a team is something the league strongly wants to discourage. My solution would have been to whack the Chiefs a sixth-round pick and then do what the league so often does when it hears about teams doing things it doesn’t want—distribute a strongly worded memo to teams saying that the league will be watching contact between teams and looming free-agent players, and that any evidence of such contact will be dealt with severely, much tougher the next time than a sixth-round pick. I just think the rule is enforced in such a lax way now. Coming down hard on the Chiefs is overkill. 2. I think Pittsburgh’s Martavis Bryant is clearly one of the most dangerous receivers in football, as illustrated by his 17 touchdown catches in 24 career games—one of them the circus, pinned-to-his-legs job against Cincinnati in the playoffs in January. But when word leaked Saturday that Bryant was facing a year-long suspension because of another positive substance-abuse test, his agent told Tom Pelissero of USA Today that there were depression issues involved. That makes this a more complicated issue. Should the suspension hold, by the end of the 2016 regular season Bryant will have missed 20 games due to substance suspensions and played in 24. How do the Steelers count on him going forward? For now, it’s smart they signed a more athletic downfield tight end, Ladarius Green, in free agency. 3. I think some team (Baltimore? Oakland? Dallas? Pittsburgh?) is going to get a huge bargain in Eric Weddle. 4. I think the Browns are correct in offering a third-round pick for Colin Kaepernick, as Mary Kay Cabot of Cleveland Plain Dealer reports, and not a two, which San Francisco wants. I would hold firm if I were the Browns. Why? Because there’s a cloud of uncertainty, to put it mildly, about the future of Kaepernick as a team’s long-term quarterback. Cleveland’s third-round pick is the 65th overall in the 2016 draft. If I’m 49ers GM Trent Baalke, I take it—because he has to know there a decent chance Kaepernick would not win a competition for the 2016 Niners quarterback job. 5. I think the biggest bargain in professional sports continues to be Tom Brady, who once again has redone his contract for the good of the team’s cap health. Cap numbers for the next four seasons for Brady: $14 million, $14 million, $22 million (in 2018, when the cap should be around $180 million), $22 million. Great point by Tom Pelissero of USA Today: Brock Osweiler will make $7 million more than Brady over the next two seasons. 6. I think it’s also significant that Brady’s base salary in 2016, via the terms of his new contract, is $1 million, which means a four-game suspension (if the NFL wins the Deflategate appeal and Roger Goodell chooses to enforce his four-game suspension of Brady) will cost him only $235,294. Before his restructuring, a four-game ban would have cost Brady $1.88 million. Good show of love for Brady by the Patriots, while at the same time benefiting the team’s cap long-term. 7. I think whoever signs Chris Long—I am guessing Atlanta, New England or Dallas, but those are just guesses—should plan on him being a 550-snap player, not a 950-snap player. He’d be more effective playing half the time, and wouldn’t wear down. 8. I think to learn why Johnny Manziel is who he is—and to learn why none of the 31 other teams claimed him on waivers when the Browns cut him after two seasons on Friday—you’ll need to read Emily Kaplan’s story at The MMQB on the life (so far) of Manziel. It will be posted later this week. 9. I think I understand Green Bay GM Ted Thompson wanting to let the market settle down at all positions. But I think he absolutely, unequivocally should have been a player in a pretty good tight end market. Ladarius Green signed for $5 million a year with the Steelers. That would have been a perfect player for Aaron Rodgers, a big tight end who can go downfield, at a very fair price. It’s good to have an organizational philosophy. But there is no philosophy that is unbreakable. Thompson simply has to be more flexible when there are reasonably priced players available who would be of good value to his team. a. Whoa. This story from the New York Daily News is downright scary, about the life of fitness guru Richard Simmons. b. Thanks to Sean Doolittle, reliever for the Oakland A’s, an athlete who does good things. And thanks to Tyler Kepner of the New York Times for writing about it. c. The Denver Post team—Troy Renck, Nicki Jhabvala, Mark Kiszla, Woody Paige and the rest—did a heck of a job on the Peyton Manning retirement story. I gained a lot of respect for Renck, the longtime baseball writer now covering the Broncos, when I walked into the press room Monday for the Manning shindig and there was Renck researching how other great players had been feted in the press upon retirement. d. The indefatigable Patrick Smyth and his Broncos media relations staffers were terrific Monday too. e. Thanks to former New England left tackle Matt Light and Harpoon Brewery in Boston for including me in their fundraiser last week in Boston. The Light Foundation is an example of how an athlete, retired or active, can do a ton of good in the world. f. Way to go, Buffalo Bulls. The men and women are both headed to the NCAA Tournament for the first time, in tandem, in school history. h. I never thought, living in Jersey lo those many years, I’d ever again refer to Seton Hall as “Big East Tournament Champion.” Good for the Pirates. It’s been a long slog—23 years. i. Monmouth, on the road or on neutral floors, beat power-conference schools UCLA, Notre Dame, USC, Georgetown and Rutgers this season. Eleven of Monmouth’s first 12 games this year were played on the road or at neutral sites. Monmouth had one home game before Jan 4. Monmouth went 17-3 in conference, and 27-7 overall. Monmouth was left out of the NCAA tournament. j. I loved the ESPN commentators berating the NCAA Tournament committee about this on Sunday night. n. RIP, Marty Mulé, Louisiana sports writing star. You’ll be missed. See what smart teams do?